“Bunny Man: Artist's Rendition,” braddockheritage.org/, accessed April 24, 2019, http://braddockheritage.org/items/show/26. Bunny Man is a local character - part real and part myth - who appeared in the 1970s in the Burke area. According to newspaper accounts, a man in a rabbit suit threatened a young couple in a parked car on Guinea Road, telling them they were on private property and then hurled a hatchet through the right front window. Police recovered the hatchet. In another incident, a construction security guard reported seeing him chopping at the roof support of a house under construction. 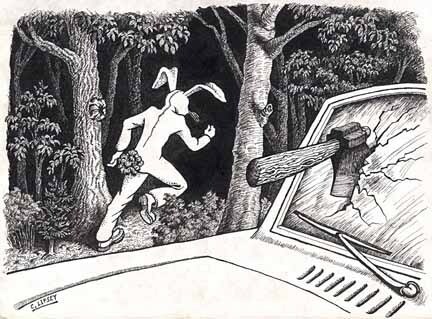 When the security guard went to get his gun, the Bunny Man skipped off into the darkness, carrying his axe. In a third incident, the Bunny Man accused Kings Park West residents of dumping trash. In the 1980s, his legend had grown more sinister, alleging several gruesome murders to his credit. A railroad overpass near Fairfax Station, which myth considers his main haunt, has earned the name Bunny Man Bridge. He has never been caught, and his legend lives on. Copyrighted material. Not for reproduction without permission of owner.